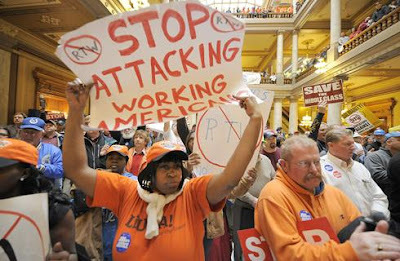 Trade unionists and progressives rally at Indiana State House in Indianapolis Feb. 22. Photo by Alan Petersime / AP. "A word on apathy -- I generally consider it to be a non-issue. Workers are not apathetic; there are lots they care about. But they have to have restored faith in their unions and legislators to act -- we are working on that one. Apathy is a label used by the hegemonic few to cover fear, intimidation, and hopelessness." INDIANAPOLIS -- Until late last week, the general media practice, including NPR and Democracy Now, had been to ignore labor militancy in Indiana. However, the movement here in Indiana has been much more energized and larger than many expected. A state issues forum that was held during the afternoon, February 20, in Lafayette, Indiana on the draconian Republican legislative agenda drew a standing room crowd, about 150, largely public school teachers but with a number of Building Trades, Steel and UAW unionized workers. The event was sponsored by the Obama group Yes We Can Tippecanoe with support from the Lafayette Area Peace Coalition. The response to the threats to workers, teachers, and public education was a collective expression of anger coupled with a general recognition that the Indiana Republican agenda is a threat to the entire working population of the state. An estimated 10,000 trade unionists and other progressives mobilized at the State House on Tuesday. February 22. Democratic members of the Republican-controlled legislature began to absent themselves from sessions, forestalling a required quorum. Similar to the actions of Wisconsin politicians, Hoosier legislators assembled in Illinois. Their agenda was to say “no” to Right-to-Work legislation and to demand real dialogue on a variety of bills on the legislative docket that would radically transform education in the state and hit employed and unemployed workers even harder than RTW alone. I attended the Thursday State House rally organized by the Indiana State AFL-CIO. As we were going through the security check we heard a roaring crowd inside the rotunda of the old-fashioned State House building. As we entered the rotunda we saw about 2,000 workers from the ground level to the third floor cheering a militant speech from the president of the Kentucky AFL-CIO. Other speakers condemned the attack on workers, exhorted them to continue the struggle, and connected the issues -- Right-to-Work, draconian cuts in unemployment benefits, threats to pensions and benefits, destruction of collective bargaining for public employees, and all the efforts of Governor Mitch Daniels to privatize and destroy public education. Angry workers showed placards from the UAW, SEIU, various Building Trades unions, including locals representing electricians, plumbers, carpenters, and painters. A speaker from the Indiana State Teachers Association thanked the State AFL-CIO for connecting the fight-backs of manufacturing, service, and construction workers with those of education workers. Talking to business agents and other labor leaders, I learned that the Republicans had offered a deal to the construction and manufacturing unions to take RTW off the table if rallies were ended. The leaders made it clear that organized labor in Indiana saw this proposal for what it was, an effort to split the labor movement and the working class. One labor leader claimed that a deal beneficial to teachers had been offered the Indiana State Teachers Association, which is not affiliated with the AFL-CIO. Apparently the teachers rejected it. Workers of all kinds have become aware of this standard practice political elites use to split the working class and it has been rejected. Protesters were also suspicious of press reports that the Governor and the legislature had “pulled” RTW off the table. Legislative procedures, several said, made the situation fluid. The discourse, speeches, informal conversations, chants, and picket signs all spoke to the emergence of real class consciousness this time. Over the next days and weeks the trick will be to keep the momentum, militancy, and sense of solidarity alive. And, as one friend put it, rank-and-file trade unionists, particularly younger members, need to understand that whatever the outcome of this immediate campaign, vigilance will be necessary. A good labor history lesson would make it clear that factions of the capitalist class resumed the struggle to push labor back even before the ink was dry on President Roosevelt’s signature making the Wagner Act of 1935 labor’s “Magna Carta” law. By 1947, Republican majorities successfully turned back significant worker rights with the Taft-Hartley Act which made state laws, such as Right-to-Work, possible. The Indiana, Wisconsin, and Ohio cases show the possibilities that can be achieved by progressives, including trade unionists, working with some members of the Democratic Party. The legislators in Indiana and Wisconsin have been forced to act in ways that demonstrate their real support of workers. The level of worker anger and mobilization made it clear to Senators in Wisconsin and House members in Indiana that they need to give concrete support to the mass mobilizations that are taking place. As an old labor film ends, a life-long activist is quoted as saying “You think this is the end? It’s just the beginning.” The fight-backs in Wisconsin, Indiana, Ohio, and elsewhere have rekindled labor militancy, and the rudiments of class consciousness. The most reactionary sectors of the capitalist class will not bow to mass movements without much more mobilization and struggle. Without falling prey to romantic comparisons with the ferment in the Middle East, it may be the case that, as with Egypt, a general strike is the only action that will stop the drift toward unbearable and deepening misery of the working class.